Robotic arm controlled over the internet to perform pick and place operation. 1. Particle-core-2: This module receives the control commands from core-1 and activates the robotic arm accordingly. Since the commands can be sent over the internet the control commands can be sent from any part of the world with an internet access. This gives us the power to employ the robot in remote, isolated and dangerous environments ..It can also be used in industrial automation. Robotic arm from OWI has been used in this project. Three motors of the robotic arm are controlled using motor drivers and a Particle core (Core-2). Two H-Bridge modules based on L298N are used to drive the motors using a 9V power supply. In the robot, the bottom most motor or the shoulder motor is used for horizontal (left - right) motion. The middle one or the elbow motor is used for vertical (up-down) motion. The motor at the tip (the hand) is used to control grab-release motion. The robotic arm module is controlled by Core-2. This module uses a Particle Core (Core 1). interfaced with two accelerometers which are used like joysticks to send commands to the robotic arm. The user gestures are captured as commands and published as events using Spark.publish(). Particle-Core 2, explained above, which controls the motors, subscribes to the events published by this particle core. The control of the arm is based on the tilt measured by the accelerometer . For example if the Accelerometer-1 is tilted to left then the command to be published is 'left'. 1) The controller range is very large. The arm can be control from anyplace in the world with internet access. 2) Since the commands are sent over WiFi the arm can be placed in an isolated/dangerous areas like nuclear power plants and other industrial setups where it is not possible to employ humans due to health and other risks. 3) If sufficiently strong robotic arm is available then it can assist in lifting heavy objects. The sensors can be placed on human arm and the robot can be made to mimic the human arm. Motor wiring schematic. Used H-Bridge to drive the motors. 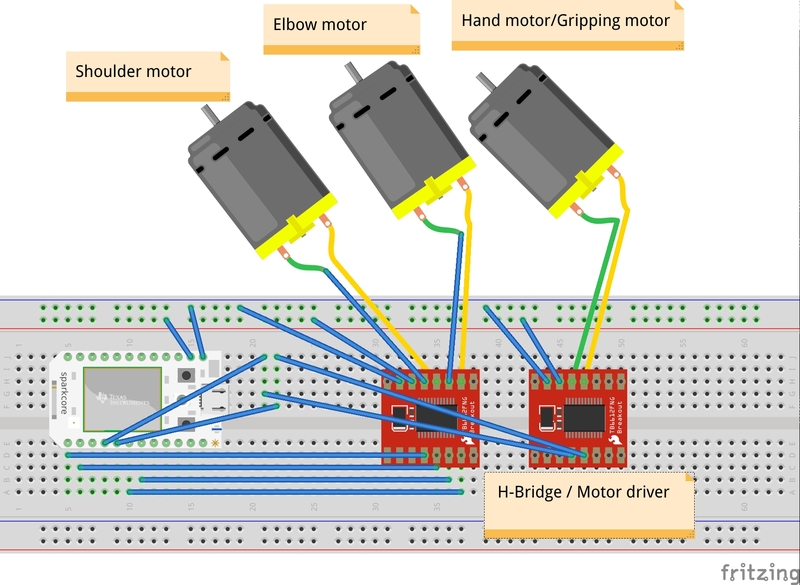 This module consists of H-bridge and motors to control the arm. Three motors are controlled based on the command received from the acclerometer control. This module consist of a particle core and two accelerometers. These two accelerometer are used like joysticks to send command to the robotic arm over the internet.